Get on the Bus! ?Your support matters, please let us know if you plan to attend by calling 519-325-0226 or 519-800-3040 by Friday February 20. All are welcome! Photo Op: Residents of Essex County will deliver over 360 newborn hats, which will hang with personal messages on why maternity services are so important to the community. The hats will be strung together and displayed in a highly visual event in front of Ms. Matthews’ constituency office. The hats are symbolic of the 360+ births that happen each year at the Leamington Hospital. Where: The constituency office of Deb Matthews, 242 Piccadilly St., London ON. When: Saturday February 28, 12 noon. What: Rally to Save Birthing, Maternal and Child Care Services at the Leamington Hospital. Citizens of Essex County are taking their deep concern about the proposed cuts on the road to try and bring their message to Ontario’s provincial government, which is responsible for the cuts. Deb Matthews is the nearest Cabinet Minister in the Wynne government. In fact, in her cabinet position as President of the Treasury Board of Ontario, Deb Matthews is responsible for government cuts. She has overseen the real dollar cuts to funding for hospital services in Ontario, including the Leamington Hospital. The Leamington Hospital is facing the complete closure of its obstetrics unit. If maternity services are lost, women are at risk of giving birth on the highway and in precarious weather conditions as they travel to Windsor, more than an hour away, to deliver their babies. 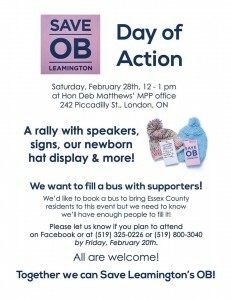 On February 28, concerned residents will be carpooling to Ms. Matthews’ constituency office in London to deliver over 360 newborn hats, representing the 360+ births that happen each year at the Leamington Hospital. Each hat will have a personal message attached with heartfelt words in support of maternity services in Leamington. Who: Save OB Leamington, the Essex County Health Coalition and the Ontario Health Coalition. For more information: Kimberly DeYong, Save OB Leamington, 519-839-6328; Kim Johnston, campaign director, Ontario Health Coalition, 416-441-2502 (office).